Amidst the bevy of dynamic young designers vying for the NEXT award at the recently concluded HSBC Colombo Fashion Week, it was Ayesh Milendra Wickramarathne with his collection of pirate-inspired wear who took home the prestigious award. The Emerging Designer Development Programme —run by HSBC Colombo Fashion Week mentored by designers Kanchana Thalpawila,Darshi Keerthisena and Upeksha Hager had 11 fashion hopefuls in the fray. Winning the award was completely unexpected, says Ayesh, as he had had only 10 days to prepare himself for the showcase. “I am beyond excited and happy about winning this award,” he told the Sunday Times. Despite being the last to be selected for CFW and being unable to attend the workshops Ayesh was able to impress the mentors (and judging panel). “I met Darshi Keerthisena first with only six designs and four sketches, she was impressed and was like ‘Wow you are different from the rest and you have a lot of ability’. Upeksha told me that my colour balance was good and that I could do something more than the sketch. Kanchana pointed out the mistakes and told me where I could improve,” he says. Ayesh is grateful for the knowledge he gained about the industry as a result of his CFW exposure. He was able to build new contacts with popular designers and models, because some didn’t really know who the creative mind was behind his designs. “It was a good experience,” Ayesh added. 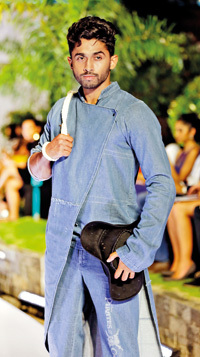 Ayesh’s was the only collection at this edition of CFW catering solely for men. It was a “tough, challenging task” and a lot of thought went into fabric selection, cuts and designs, he explains. By merging designer wear with denim, Ayesh was able to experiment with finishes like washes, patterns and prints. “Denim suited my theme and it was easy for me to play around with it and introduce new designs. We always see normal, simple things done out of denim but we actually can do a lot more,” he says. His denim collection that won him the NEXT award was inspired by the Pirates of the Caribbean franchise. Having always been drawn to the fantasy-adventure genre, Ayesh pointed out the pattern of movies influencing fashion trends, using that to place emphasis on the magical experience he felt watching one of his favourite movies. 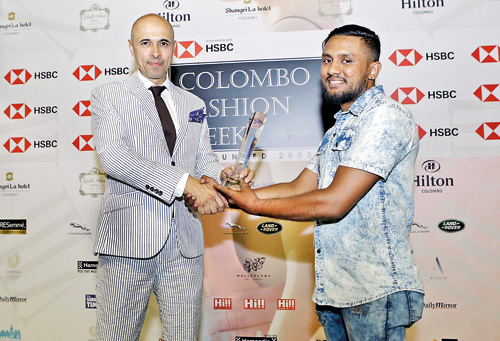 An alumni of D.S Senanayake College Colombo 7, 25-year-old Ayesh completed his Higher National Diploma in Fashion Design Studies at the University College of Ratmalana, graduating last year. He emerged first in his batch and also won the most outstanding designer award winner at the Graduate Fashion Show 2018. Never really interested in his studies, he always ended up getting low marks, he confesses. “Everyone put me down whenever I came up with something saying that I couldn’t do it.” However in his last project his task was to design resort wear including batik designs for the Amanwella resort which he scored high marks for. He thanks Kanchana Thalpawila who helped him join an internship programme that changed his life and influenced him to follow a path in the fashion industry. Singaporean chicken rice brings a taste of East to C.O.W.